I have a few big announcements about HandmadeCon 2016 to make, and here’s the first: this year I’ve invited representatives from the major engine developers to come to our very first HandmadeCon job fair! It’s our attempt to create a pleasant environment for engine teams and prospective job candidates to get to know each other. As of now, I have confirmation from Epic, Unity, Blizzard, and Thekla, and I will be working to finalize arrangements with a few more major teams right up until the conference begins. There will also be a surprise guest at the job fair this year, whereby “surprise” I mean they sent me e-mail out of the blue asking if they could participate, even though they aren’t technically a game engine developer. What is the job fair going to be like? One of my goals for HandmadeCon 2016 was to provide more structured opportunities for people to get to know each other. 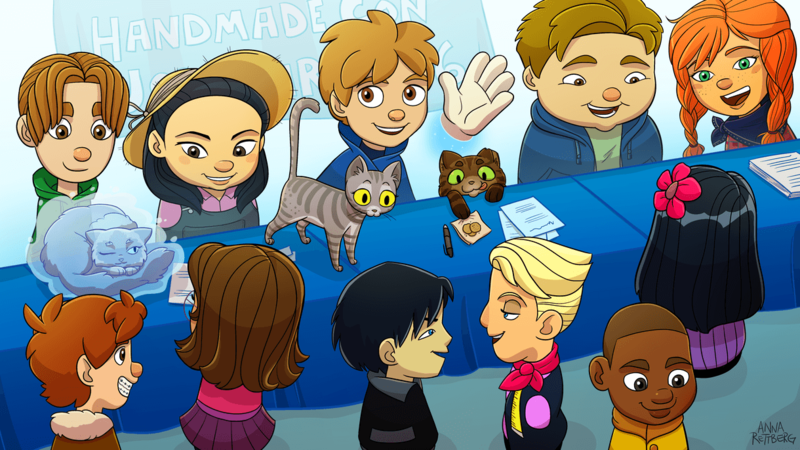 At HandmadeCon 2015, which was a much smaller event, the attendees themselves did a wonderful job organizing get-togethers surrounding the conference, and they were great! So this year, I’m trying to amplify that. To that end, I’ve rented a reception space adjacent to the lecture hall for our use all day on the Sunday of the conference. During the day, this space will be set up so that people can use it to mingle during breaks (which will be much longer this year, with plenty of time for discussions) or as a convenient place to gather for extra-conference outings. At night, after the conference ends, it will serve as a three-hour reception area which includes the job fair. Each engine team will have their own table at the reception, with a giant banner so they’re easy to find. Each team will have at least one programmer at their banner, and they’ll be wearing little Handmade Hero lapel pins so you know who they are. Attendees are invited to gather around, introduce themselves, ask questions, and listen to what the engine programmers have to say about what it’s like to work on their team, and what they’re looking for in potential applicants. Like everything at HandmadeCon, it’s designed to be pleasant, informal, and as close as possible to the atmosphere of game developers talking with each other about the stuff they care most about. Does your company have an engine team that would like to participate? Awesome! Send an email and let me know. There’s really only three requirements: you must do serious engine development work in-house, you must at least occasionally hire people onto your engine team, and you have to agree to send between one and four engine programmers to participate in the job fair. Their tickets will be comped, and you don’t have to bring anything or pay for anything. That said, HandmadeCon is nothing if not a dictatorship subject to my capricious whims, so I of course reserve the right to refuse to include any company in the job fair for any reason. See? This is why democracy matters, people! Oh, and just in case it wasn’t clear from the above description: recruiters, HR people, or any other role which is not specifically about programming is strictly prohibited. This job fair is only meant to feature people involved in the daily development of game engine code. I’m getting very close to having the schedule finalized, so expect more announcements in the coming days about who’s speaking about what, and when. I’ll also be announcing the final list of job fair companies once everyone has officially confirmed. If you’d like to be sure not to miss anything, you can always sign up for our mailing list in the box below to have all Molly announcements delivered straight to your inbox!